For America’s most ardent liberals and conservatives, polarization begins at home. In what may seem like stereotypes come to life, a new Pew Research Center study on political polarization finds that conservatives would rather live in large houses in small towns and rural areas — ideally among people of the same religious faith — while liberals opt for smaller houses and walkable communities in cities, preferably with a mix of different races and ethnicities. And sizable minorities of both groups say they’d be dismayed if someone from the “other side” were to marry into their family. Those findings, and others in the Pew Research report, illustrate how ideological and partisan loyalties can both reflect and reshape Americans’ everyday lives. What about neighbors? 76% of consistent liberals said racial and ethnic diversity was an important factor in deciding where to live, compared with just 20% of consistent conservatives. 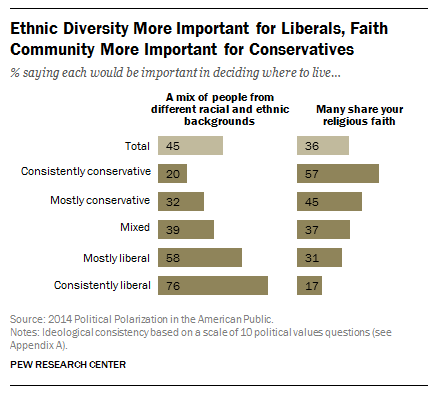 The latter put much more value on where many people in a place share their religion: 57% called that important, versus just 17% of consistent liberals. 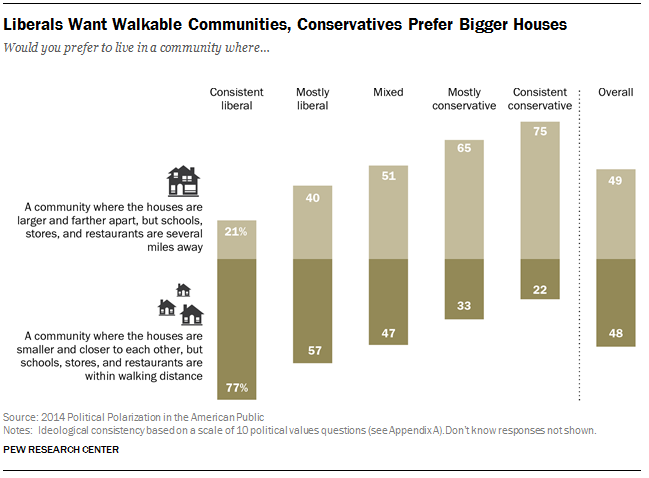 Fully half of consistent conservatives, and 35% of consistent liberals, say it’s important to live in a place where most people share their political views. And some researchers have, in fact, found evidence that such preferences factor into where Americans decide to move. Most — but not all — Americans are comfortable with political diversity in their households, the Pew Research report found: Just 9% say they’d be unhappy if an immediate family member married a Republican, about the same percentage (8%) as those who say that about marrying a Democrat. Even among partisans discomfort levels are fairly low: About as many Republicans (17%) and Democrats (15%) say they’d be unhappy if a family member married someone from the other party. But discomfort rises among the most ideological segments of the population. 23% of consistent liberals say they’d be unhappy about a Republican marrying into their family; 30% of consistent conservatives say that about the prospect of a Democratic in-law. How about you? Do you find yourself gritting your teeth when listening to your in-laws’ political views? Do you feel like a conservative island in a deep blue sea, or vice versa? Do neighborhood barbecues devolve into partisan condiment-flinging? Tell us how political polarization — yours or others’ — affects the way you live.